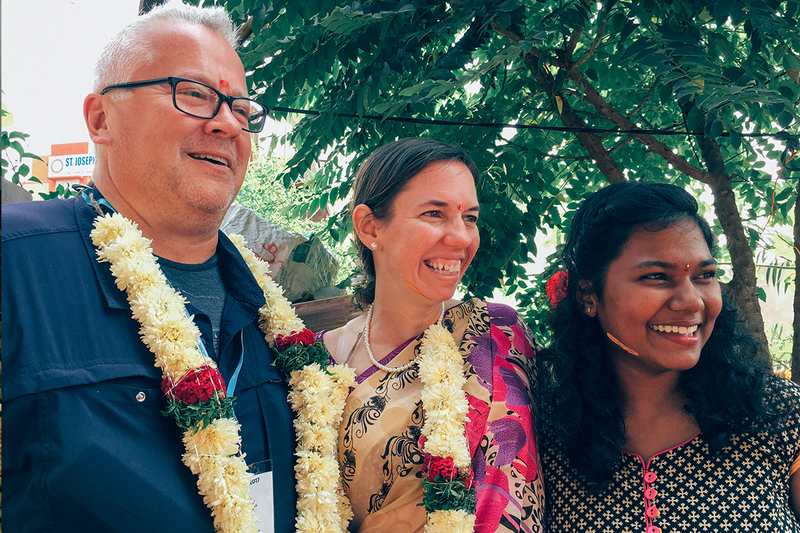 “Ever since the sponsored family [learned] that Amy and Jeff would be arriving as a couple, they decided to organize the wedding ritual at their house,” said Simon Raj Pasala, manager of Unbound programs and evaluation in Hyderabad. A central part of sponsoring a child, youth or elder through Unbound is the relationship that forms between sponsor and sponsored friend. That relationship often extends to the families of both parties. That was the case with Amy and Sravanthi. 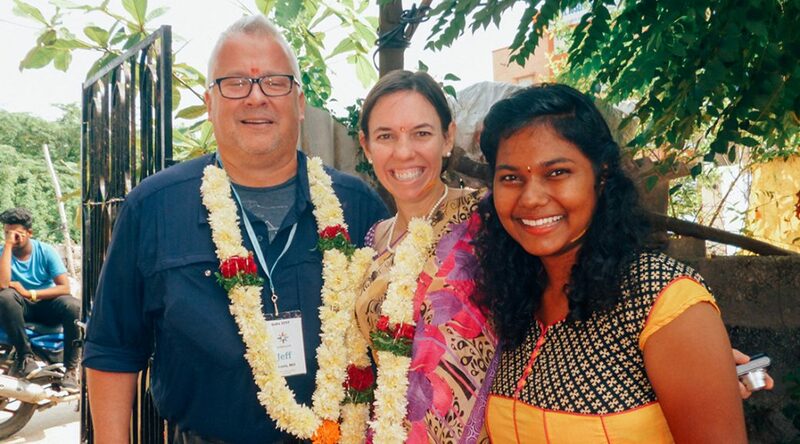 Sravanthi’s family saw the visit to their home as a chance to “celebrate the togetherness” of Amy and Jeff, Simon noted. The hospitality the family showed the couple would befit family members, and it was touching. “The time they took to prepare all of it, to get ready for our visit, they really went out of their way to make us feel welcome,” Amy said. 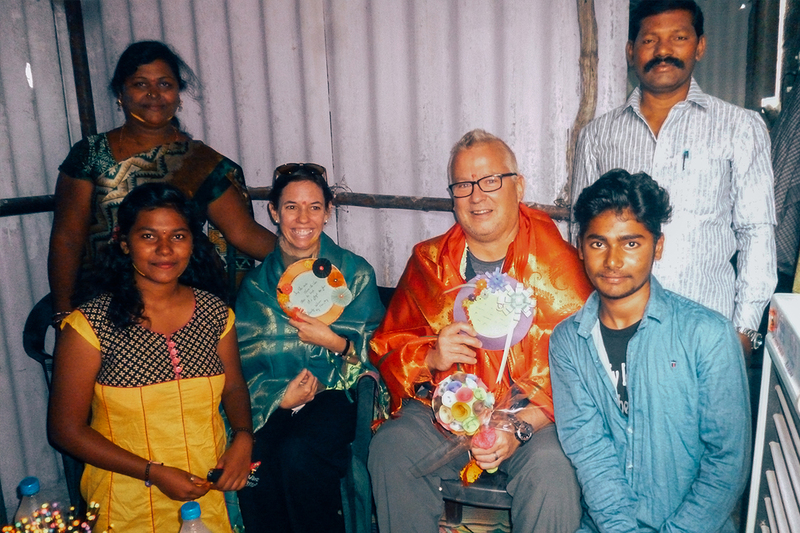 Amy and Jeff (center) don their traditional wedding shawls as they pose for a photo with Sravanthi’s family in their home. The family then presented Amy and Jeff with garlands, similar to the leis worn in Hawaii, and led them in the ceremonial exchange of the garlands, with Amy and Jeff placing them over each other’s heads. The ritual of exchanging varmala is one of the most important rituals in an Indian traditional wedding ceremony, Simon noted. Amy and Jeff exchange ceremonial garlands to commemorate their marriage. Sravanthi’s mother presents the couple with a basket of fruit. After the exchange of varmala, it was time to celebrate and provide the bride with some pampering. Sravanthi’s mom brought out a colorful platter of fruit, expressing that it represented a “fruitful and bountiful marriage.” The platter was piled with bananas, apples, pomegranates and native fruits. Then, Sravanthi’s father presented the couple with a piece of artwork for their home back in St. Louis. Sravanthi then displayed beautiful bouquets of handmade flowers that she had created out of paper. 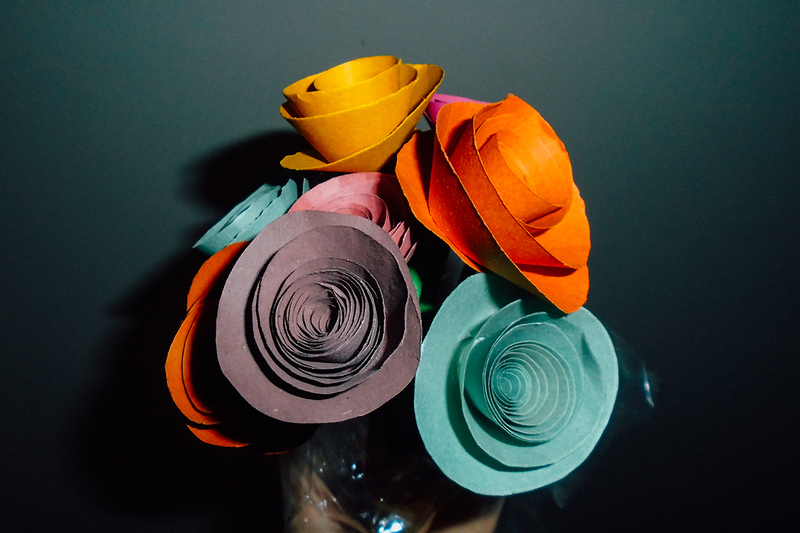 The handmade paper flower bouquet that Sravanthi made for Amy. Then it was time to get the bride ready to present to the groom, according to Indian tradition. Sravanthi’s father shuffled Jeff outside while the women ushered Amy into the back room. They gave her a sari that they had handpicked and purchased for her, helped her dress, provided matching bangles, fixed her hair and painted her nails. Amy walked outside and everyone cheered and celebrated. The once-again newlyweds, along with the Hyderabad staff, were amazed by the thoughtfulness and generosity of Sravanthi and her family. 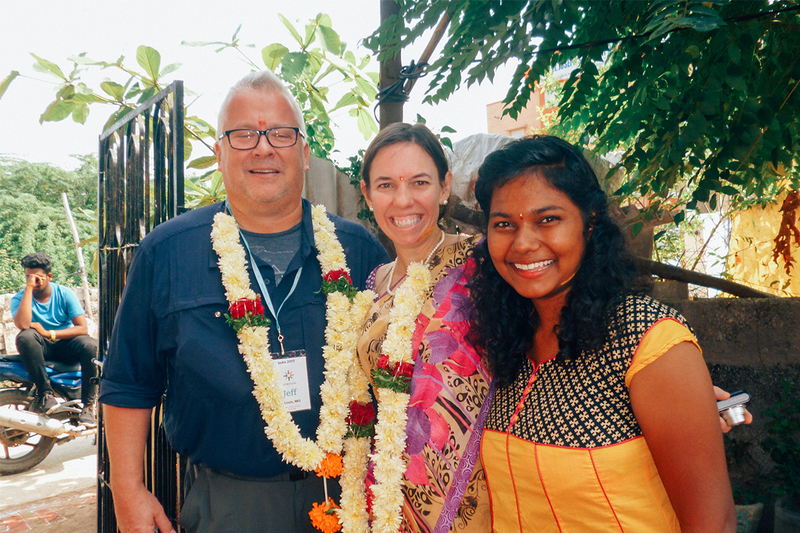 Jeff, Amy and Sravanthi spend a few more happy moments together on their visit to Sravanthi’s home. Amy felt a connection with Sravanthi’s mom. The two women are about the same age. The reality of being in the same place in life but living in such different circumstances was eye- opening for Amy. She saw how hard-working Sravanthi’s mother is, being a part of the local Unbound mothers group, having taken a loan from the group and opening a shop to help support her family. Sravanthi is following in her mom’s footsteps, hoping to own her own business someday. Amy saw clearly that it was because of the hard work of Sravanthi’s mother that Sravanthi’s life had changed for the better. In the same way, Jeff was inspired by his short time with Sravanthi’s father, while Amy was being pampered in the back room. Celebrate togetherness by partnering with someone in need. Sponsor today. Thank you for sharing. Beautiful story of wedding in India.